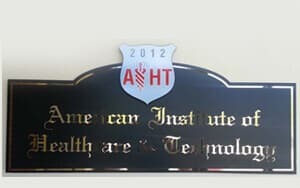 The American Institute of Healthcare and Technology offers admission to students who meet certain requirements. AIHT’s admission requirements are put in place to ensure students achieve academic excellence in their program of choice. The minimum academic standard students must attain to be considered for admission into AIHT includes, but is not limited to a high school diploma or GED. AIHT being an establishment for higher learning administers the Wonderlic Scholastic Level Exam (SLE). This exam is one of the factors that will be considered in determining acceptance into your medical program of choice. The SLE is a standardized admissions test that will assess your Math and English knowledge. A minimum passing score is required to be eligible for enrollment. AIHT allows students to retake the admissions test if first attempt is unsuccessful. Students who wish to enroll in the Diagnostic Medical Sonography and Echocardiography programs may be required to attend an additional interview with school director. Interviews are both informative and evaluative: they allow you to learn more about the program, while providing the director with an opportunity to ask you additional questions on behalf of the Office of Admissions. Interviews for DMS and Echo Students will be held on the day of the admissions test.